Valley County Pathways encourages Valley County residents and second-home owners to attend public meetings scheduled for Tuesday, Jan. 10, in McCall to learn about the planned reconstruction of 5.5 miles of Warren Wagon Road and push for pedestrian safety and bike lanes as part of the project. There will be an afternoon session from 1-2:30 p.m. on Jan. 10th and an evening session from 6:30-8:30 p.m. Both meetings will be held at the Payette National Forest supervisor’s office, 500 N. Mission Street in McCall. Federal highway officials and Valley County Road Department officials will be on hand to present information about the project and answer questions. Valley County Pathways and the Central Idaho Mountain Biking Association (CIMBA) have been promoting that the project include bike lanes of at least 3 feet wide to accommodate pedestrian safety on this popular and busy road that leads to the North Beach unit of Ponderosa State Park and points north in the Payette National Forest. As it is now, this section of Warren Wagon Road has no shoulder and presents a safety hazard to walkers, runners and cyclists. Federal highway standards call for a minimum 4-foot width for bike lanes. 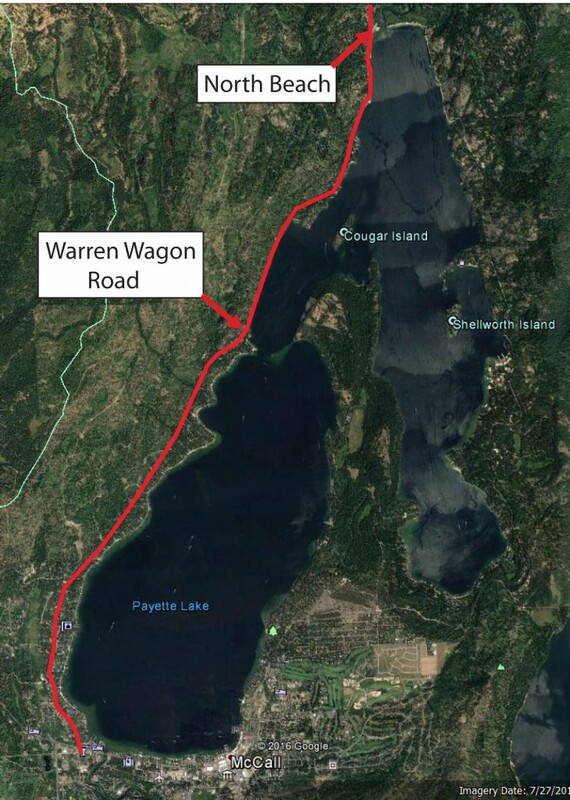 In the case of the Warren Wagon Road project, the right of way is limited in some areas because of granite cliffs next to the mountain and roadway. We understand that space is limited, and if Federal Highways designed the project to dynamite granite cliffs to make more room, it would drive up the cost to more than $10 million beyond the existing cost, and Valley County would be required to maintain loose and falling rock for years to come. Previous letter-writing efforts have succeeded in convincing the Federal Highway officials that pedestrian safety and bike lanes are an important part of the project. Thank you for helping with that. However, we need a strong turnout at these meetings to continue to show support for pedestrian safety and solid bike lanes. For information about the project, contact Erin Chipps, environmental specialist, erin.chipps@dot.gov (360) 619-7637, Dan Slanina, project manager, Daniel.slanina@dot.gov (360) 619-7617, Steve Stuebner with VC Pathways, sstuebner@cableone.net, 208-484-0295, or Michelle Reagan with CIMBA, michelle@gravitysportsidaho.com. Can’t be present at meeting- but support real bike lanes. I ride there- and there are many blind spots- riding on the road is frightening. I can’t be present at the meeting but I strongly support bike lanes for my own and others’ safety and other reasons. Bike traffic everywhere around McCall is growing fast and we will be sorry if we don’t address this area when the road is reconstructed. This route is a popular one to ride all the way up to Secesh Summit – it is one of the only longer road rides with real elevation gain. This section is popular on its own because of the views, it is also an add-on to the ride to the Summit. This is an important section for an appropriate bike lane. The amount of big truck and big RV traffic make it especially dangerous. Safety of cyclists is paramount. Thank you for considering my comments even though i cannot be present at the meeting. Many thanks to CIMBA and McCall Pathways for all your work to support a bike lane in this section. We support construction of bike lanes from the Highway 55 turnoff at Lardo to the Eastside Dr. Intersection past north beach. We believe the safety of cyclists and pedestrians is more important than the 4′ federal minimum path width. We own property in Wagpn Wheel Bay and have observed increasing usage since 2000. Being a McCall resident, and avid cyclist, this is something that is solely needed, for safety sake, and for the sake of the local community and for the sake of all important visitors that McCall depends on so much. I meant to say, sorely needed!